Had a look at these in Firefox 52 and the active tab hover is blowing up. The default already specifies that the hover tab images only get applied to the inactive tabs, not the selected (active tab). However, because of the strange way they are writing code in there, poor old Firefox doesn't have a clue what they're on about. See? That wasn't that hard, was it? Sometime, I'll do an update for these. But they are pretty low on my list of priorities, if you know what I mean. Fixes the problem and the underline option's cool..
Do you know what Firefox version first showed that problem? I ask because (I had to look it up) that this hit Release a few days back - https://www.mozilla.org/en-US/firefox/5 ... easenotes/ .....is that OK? If it isn't, I'll need to fix it soonish, if it is then I've got a few weeks. On Win7/Fx50 Release, all is fine here....and although I spend little time on Betas ....I just noticed it on 51b1. Edit: Just updated TahrPup to Fx50 and no hover problemo. mightyglydd wrote: On Win7/Fx50 Release, all is fine here....and although I spend little time on Betas ....I just noticed it on 51b1. Thanks, 51 will hit Release in just over 5 weeks? Even I should be able to raise enough enthusiasm for updating this lot before then. I think we (again) have a vanished Extensions icon in the Addons Manager (easy fix) and that stuff above is a very safe fix that is not going to break earlier versions, because all it's doing is re-inforcing what should, and was, happening anyway.....that means no endless rounds of testing. Yep, again, it's been gone for a while.. I'll do what I should have done in the first place and that is just grab the icons from an earlier Firefox version, put them inside the theme and point to them instead. Got to be easier than chasing every name change and image format that they keep changing to for those. #7. 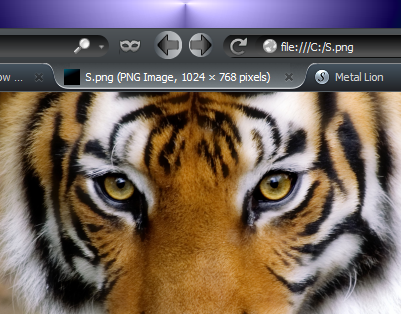 Large Download button on Tigers Fix. These changes were done on Firefox 53 and Mozilla is thoughtfully whacking themes and extensions in Firefox 57, so this is likely to be the last update on these. I even did an update on the other one (goes off to look up the name) - Metal Lion Australis, which was last updated a year ago. Obviously I had kept an eye on it since then, but it just shows you that if you ..stop...think..and then code this stuff right, that there really is no need to spend 40+ hours a month (that's what David Vincent of Noia reckoned he was doing before he packed it in) maintaining this stuff. I notice we've lost other theme authors since then, I don't mind a guy making a statement so everyone knows what's going on and then packing it in, but we've had some who have just plain vanished without a word and leaving their users in the dark. That is just pig ignorant rude, in my book. Obviously not everyone was brought up with manners, like me. Last edited by Frank Lion on November 29th, 2016, 3:25 am, edited 1 time in total. @Aah..don't need the Active Tab hover code ^ anymore. Could there be a financial incentive for them to do this..follow the money ? Couple of people have mentioned getting an Error message when updating these (that's different to an Incompatible message) and, in fact, I even had this problem myself. As you all know, the way Firefox installs stuff is pretty complicated and bizarre these days! The 'fix' is just to uninstall the theme, restart Firefox, and then just install the latest version (i.e. bypassing Firefox's update mechanism) The updated theme then installs fine. This isn't for the same reasons as here - viewtopic.php?p=14733429#p14733429 which was to sever my SeaMonkey and T/Bird stuff away from Firefox, so that it couldn't affect them. The above was done, er, because Firefox suddenly doesn't 'allow' multi-package installs! Didn't bother to tell me or anyone else, Mozilla just stopped allowing them and the user gets, yet another, Error message for no obvious reason. Plus, Mozilla is not going to 'accept' legacy stuff after (including?) 53 and no one knows if that just means new stuff or updates to existing stuff as well. Got them via Updates today, Metal Lion Customise Palette's already installed here. Just a sort of 'Info' update on these. These 3 themes will be supported* in future, but only for Firefox 52 ESR and before. At the moment, they are still OK for install from AMO and then they get whacked by them (along with all the rest) in November 2017. Before then, I'll move them to my site and write those damn webpages for them, that I hate doing. In my previous post, you notice I had to remove the very useful 'Customise Palette' extension that came with the Tigers, just so the themes could be installed, due to AMO rules. * support, in this context, just means that #1. I'll keep them available for you. #2. I'll have a final good look at them on 52 ESR and see if any small fixes are needed. #3. I'll answer 'support' questions on them, but only on the Support link on my website. Mind you, I still answer and help people anyway with my theme stuff, whether they re current themes on not. ...we will start the process of disabling legacy add-on versions on addons.mozilla.org (AMO) in September. Yeah? You think? Try clicking the links below and tell me how you're going to disable my stuff then. So, Firefox-wise, the chapter that begun on the 1st of Feb 2006 with my release of the 'Metal Lion' theme, has now been closed..............by me. It was fun. Thanks for all you did, my friend.